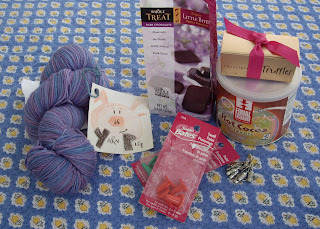 Katherine drew my name in her 4th blogiversary celebration, and she sent me the nicest parcel. 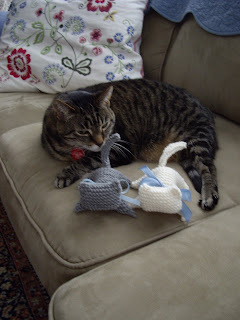 Katherine always seems so genuine in her blog -- funny, down-to-earth, and, wow, does she knit some beautiful things (like Mr. Bluejeans!). She must be a mind reader -- these are some of my absolute favorite things, and they will help me make it through this last round of prelims next week. 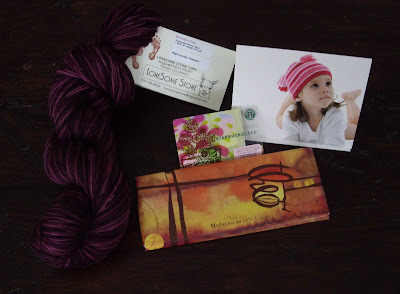 Fancy chocolate, a trip to Starbucks, a cute hat pattern, and gorgeous yarn handpainted in Colorado -- Lonesome Stone Mountain Foot in High Country Vineyard. 2) While heading into the Borders on Midvale Blvd., I was hit by a giant icicle that fell off the roof. Talk about a nasty winter surprise! Very sudden and quite painful. I have a giant goose egg now, but no concussion, and no blood, so I consider myself lucky. 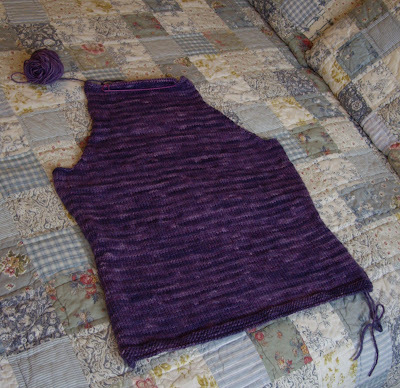 I finished the back of my cowlneck sweater on the road to Madison. 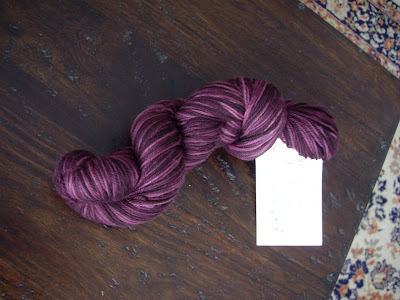 Mmmmmalabrigo, of course ("violetas"). 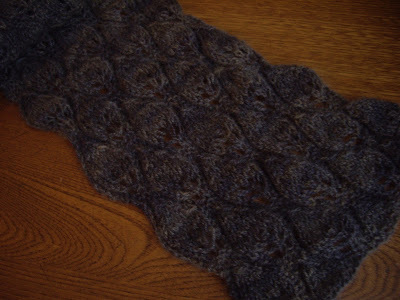 I tried using this yarn for Mr. Greenjeans and wasn't happy with it at that gauge, so I switched patterns. 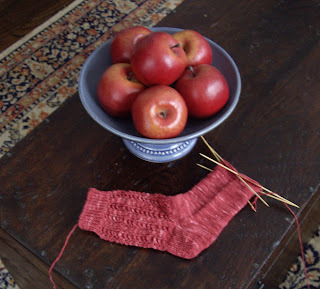 A Mr. Greenjeans is still in the queue (in green Cascade 220). Sarah kindly gave me this beautiful Plucky Knitter cashmere 2-ply laceweight that was too hopelessly tangled for her to sell. Well, my many hours of patient untangling are paying off. 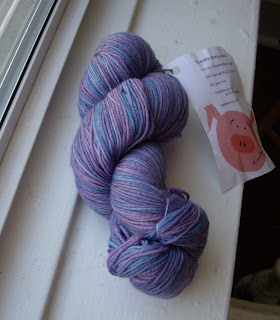 The yarn is so soft and lovely, and the colorway is subtle and classy. I think it's "Dark Day"? The pattern is the Woodland Shawl, by Nikol Lohr (AKA the Thrifty Knitter). I'm very happy with this combination of pattern and yarn. I told Paul that cashmere pajamas sound like a wonderful idea. A little overboard, I suppose? Why, oh why, is PBS pushing this on their website? Jane Austen was one of the greatest English novelists in history. Despite a rather sheltered life, she was able to capture the subtleties of human interaction so perfectly that her novels continue to be immensely popular to this day. This 5-1/4" tall, hard vinyl action figure comes with a book (Pride & Prejudice) and a writing desk with removable quill pen! 1. Heat the oil in a large, non-stick skillet (preferably one with a lid) over med-high heat. Add onions and saute until tender and beginning to brown, about 10 min. 2. Stir in the red peppers and cook 10 more min., stirring often. Mix in the sugar, vinegar, salt, and pepper. Reduce heat to med., cover the pan, and cook until the mixture is very soft and the juices are somewhat caramelized, about 20 more min. Stir occasionally. 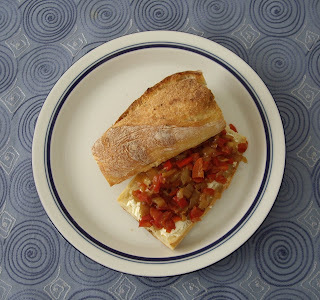 I serve this relish with goat cheese on warm French bread. Brr... it's a balmy 1 degree above zero here. 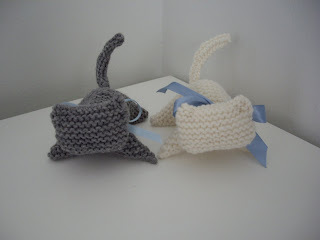 Notes: A cute, quick pattern that's fun to knit. I didn't embroider any details on the faces, since it didn't occur to me until after I had stuffed them! 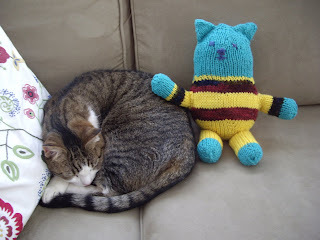 It would be much easier to do the embroidery prior to seaming and stuffing. 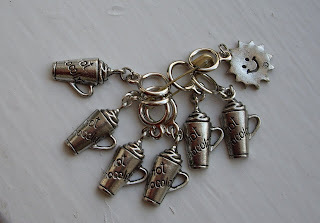 delicious Fair Trade organic cocoa, lots of yummy fancy chocolates, point protectors... and even "hot chocolate" stitch markers! Many thanks, Anne! You spoiled me marvelously. 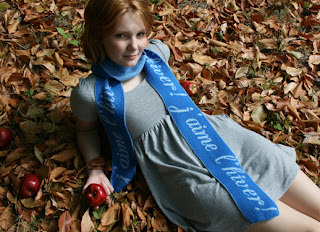 I'm smitten with this scarf made by Lulette. I was tipped off to this web shop by Emily at (Inside A Black Apple). All the scarves are knit right here in the midwest. Too cute! Most of the time I like winter quite well; however, this past week has tried even my patience with Old Man Winter. The final straws: (1) getting the car out of the craggy, slippery, icy terrain of Lakeview's side streets, and (2) navigating Chicago's many dangerous potholes. Specsknits' "Things I like about winter" inspired me to make no less than three batches of soup in the past week. 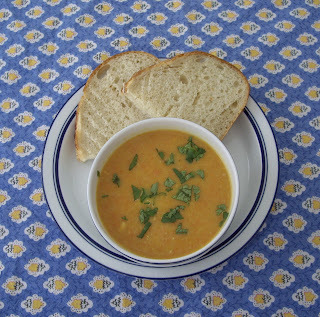 The best recipe of the lot pairs carrots and coriander, a match made in heaven. The key is to use real carrots, not the tasteless, awful little "baby" carrots. Yes, peeling them is a pain, but they have so much more flavor. 1. Melt the butter in a soup pot. Add the leeks and carrots and stir well. Cover and cook for 10 min. until the veggies begin to soften. 2. Stir in the coriander and cook for 1 min. Add the stock. Bring to a boil. Lower the heat, cover, and simmer for 20 min. or until the leeks and carrots are tender. 3. Puree with immersion blender until almost smooth. [If you don't have an immersion blender, let the soup cool a bit, then puree in a regular blender.] Add 2 T. yogurt. Taste the soup and adjust the seasoning (salt & pepper). Reheat slowly. Do not boil. 4. Ladle into bowls and place a dollop of yogurt in the center of each. Sprinkle with chopped cilantro and serve. I have an awfully hard time with food photography. Styling is a challenge, but the real problem for me is lighting. Any tips? I generally cook in the evening, and my Pentax Optio's flash just isn't up for the task. 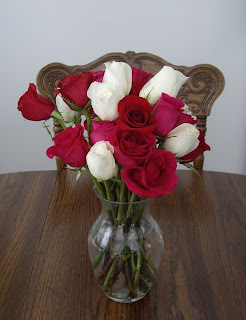 It would be nice to include photos with more of my posted recipes. On second thought, it's not just my own photos of food that gross me out. TV commercials tend to be the worst -- they often stir up feelings of revulsion. What makes for good food photos? While I didn't wake up to the winter wonderland that was predicted, plenty of big, wet snowflakes are swirling through the air now. 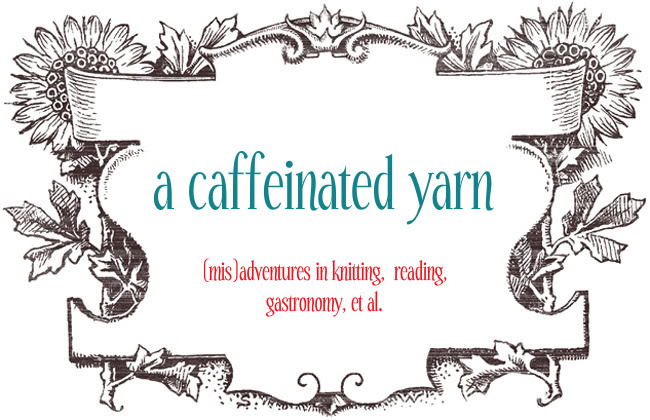 I declared today a snow day and stayed home to read for my exam, grade papers, make soup, and knit. Thank goodness for my trusty space heater... our old radiators barely crank out any heat during the day. Can it be that I'm knitting socks again? 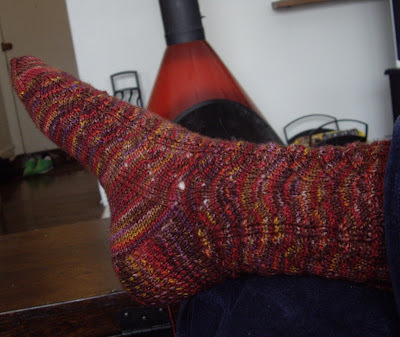 The yarn is "Dahlia" by Sundara Yarn, and the pattern is "Little Shell Socks." The color is perfect for the current Project Spectrum theme: fire. 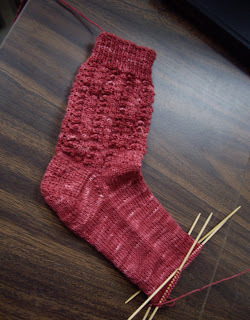 Skipping the lace pattern for the foot makes for quick knitting. 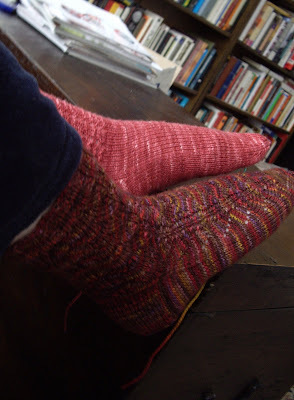 Note to self: knit some plain stockinette socks for stashbusting purposes. 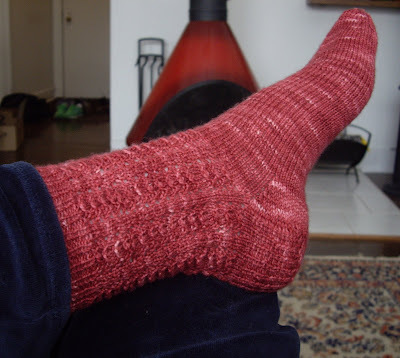 On the subject of socks, I'm absolutely in love with this free pattern that I just discovered via Ravelry. 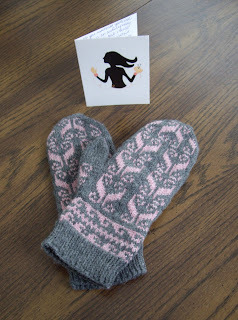 A wonderful No-More-Humdrum-Mittens Swap parcel from Amy arrived today. 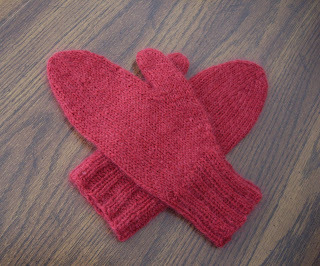 What gorgeous mittens! They fit perfectly, and they coordinate beautifully with my black down coat with the pink lining. I'll don them tonight as I brave the snow for my knitting group. Amy sent many other marvelous goodies, too. 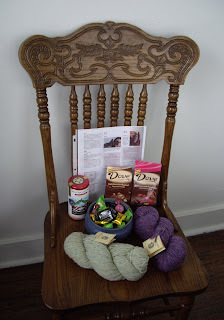 Chocolates, candy from Hong Kong, a special edition tea, and some gorgeous yarn from Beaverslide Dry Goods, which I have been dying to try for a long time. The McTaggart Tweed has a soft and fluffy texture, and the colors are beautiful. I'm thinking of a Thorpe hat perhaps? Thanks so much, Amy! Also, if you're looking for some quick, cute Valentine's gifts to knit, check out the Valentine Mug Cozy from the Classic Elite newsletter. The latest issue of The New Republic features a piece [subscriber link] by classicist Peter Green. While purporting to be a review of the new collection of A.E. Houseman's letters, "The Land of Lost Content" is a thoughtful look at A.E. Housman as poet, classical scholar, and extremely private person.